My mother loves her puddings. When I was growing up, crumbles, steamed puddings and custards were nothing out of the ordinary. She was in fact a veritable Queen of Puddings. She didn’t really go in for cakes though. I always had a birthday cake. And there was Christmas cake of course, but with one notable exception, there was little else. The exception was rock cakes. She always added a mixture of currants, mixed peel and dates to hers and I used to love them. Following in my mother’s footsteps, I’ve been making rock cakes ever since I first started baking. My basic recipe is exactly the same as the one my mother used to use, but I tend to add different fruit to ring the changes. Apple rock cakes are one of my favourites, but this time I went for sultana and prune rock cakes. As I’ve already mentioned, these cakes are both simple and quick to make. It’s just a case of rubbing butter into the dry ingredients, stirring in the sugar and fruit, then adding the wet ingredients. Rather than use plain milk, try using sour milk instead. If you don’t have any sour milk, you can make an easy cheat’s version. Head over to my recipe for Cornish hevva cake to find out how. Or you can use kefir. I often have more kefir than I know what to do with and it works brilliantly in baking. So that’s what I used to make these prune rock cakes. Another plus point to these near traditional British bakes is that they keep really well. You can store them in a sealed container for up to a week and they still taste good. Prunes are incredibly good for you and no, I don’s just mean they help to keep you regular. They contain a significant amount of boron and potassium, which helps to stabilise and possibly even build bone density. This makes prunes super helpful to post-menopausal women and people like me, who have osteoarthritis in the family. Apparently astronauts are encouraged to take 5 a day when they’re in space to keep their bones strong. Prunes also have anti-inflammatory properties, so they’re doubly good for those with arthritis. On top of their high fibre content and bone strengthening abilities, prunes also contain calcium and iron, making them particularly good for vegans. Having said all that, beware. Please don’t go overboard as too many consumed in one sitting can be positively harmful. The recommendation is to take 5-6 a day. I’m sharing my sultana and prune rock cakes with Jo’s Kitchen Larder for #BakingCrumbs, with JibberJabberUK for #LoveCake, with Mummy Mishaps for #BakeOfTheWeek and Easy Peasy Foodie for #CookBlogShare. Prune Rock Cakes. PIN IT. Thanks for visiting Tin and Thyme. If you make these sultana and prune rock cakes, I’d love to hear about it in the comments below or via social media. Do share photos on your preferred social media site and use the hashtag #tinandthyme, so I can spot them. For more delicious and nutritious recipes, follow me on Twitter, Facebook, Instagram or Pinterest. These little rock cakes may look craggy, but they are soft and almost flaky in texture. You can substitute whatever dried fruit you like for the sultanas and prunes. First set the oven to 180℃ (350℉, Gas 4). In a large mixing bowl, rub the butter into the flour, baking powder and mixed spice with the tips of your fingers until the mixture resembles breadcrumbs. Stir in the sugar and mixed fruit. Make a well in the centre and add the egg and 2 tbsp of milk. Stir with a flat bladed knife until the mixture comes together into a ball of sticky dough. Add more milk as necessary. The dough needs to be stiff enough to hold it's shape, but not so dry that you can knead it. Spoon 12 craggy mounds onto a baking sheet, spacing a little apart. They will spread a little, but not hugely if you're mixture isn't too wet. Bake for about 20 minutes or until the cakes are risen and golden, but not too dark. Set onto a wire rack to cool. Handle the dough as little as you can get away with. You'll have a softer, flakier result the less you mix it. Try not to have too much of the dried fruit poking out of the dough before baking as it's likely to burn in the oven. Keep well in a sealed container for up to a week. You were obviously a most precocious child Jo 😀 We often had them for dessert in amongst a compote of various dried fruits, but they weren’t my favourite. I suspect I wouldn’t have much cared for your dark chocolate version either. But now that sounds wonderful. A bit too sweet for me for breakfast Angie, but they’re great for later in the day. These sound really delicious! I grew up not having rock cakes (and I thought they actually were hard!) and the first time I had them was when my mother-in-law brought round a batch after little miss spice was born. Ever since then I’ve kept thinking I need to try making some one day! Lovely! My 4 and 6 year old wolfed these down as a treat-y breakfast (the only benefit of being woken up at 6am is early morning baking). We added mixed peel and prunes. Fabulous Helen. I’m not sure anyone’s made one of my recipes so speedily after posting. Glad they were a success. They are a great family recipe and it’s good to see they’re still going strong. Was there anything much different between my recipe and your Granny’s? These are just perfect for making with kids Jenny. Super easy and fun trying to make them look as rock-like as possible. I love traditional recipes – it is good to keep them alive. It really is Heidi. It’s exciting having so much to try and experiment with these days, but the old ones are often still good ones. Yes, you’re absolutely right. Rock cakes last really well. Scurries off to amend blog post! My first encounter with rock cakes was when I was very small and my sister made some. They were like rocks. It took me a long time to get over that experience. I’d love these, though and it’s really good to see prunes used in baking. I don’t think they’re used enough. Oh dear! Well I guess they had to live up to their name at some point. Does this mean you’ve never made rock cakes yourself Phil? And I agree about prunes, they can be a wonderful ingredient. Oh my goodness, not had rock cakes for eons! Great idea to add the prunes, definitely good for you and perfect for baking! Make some Kavey. They are dead easy to make and so good – especially with the prunes. I remember making rock cakes in school – prob one of the first things I ever cooked and not sure I’ve made them since. I should take a trip down memory lane and make them as this looks delish! Oh you definitely should. It would be a sad thing indeed if rock cakes became a thing of the past. It is really very very easy to make. I like to make different types of recipes from my childhood. I will also try Prune Rock Cakes. Thank you for sharing your wonderful rock cakes. It can be quite therapeutic to have a trip down memory lane from time to time. 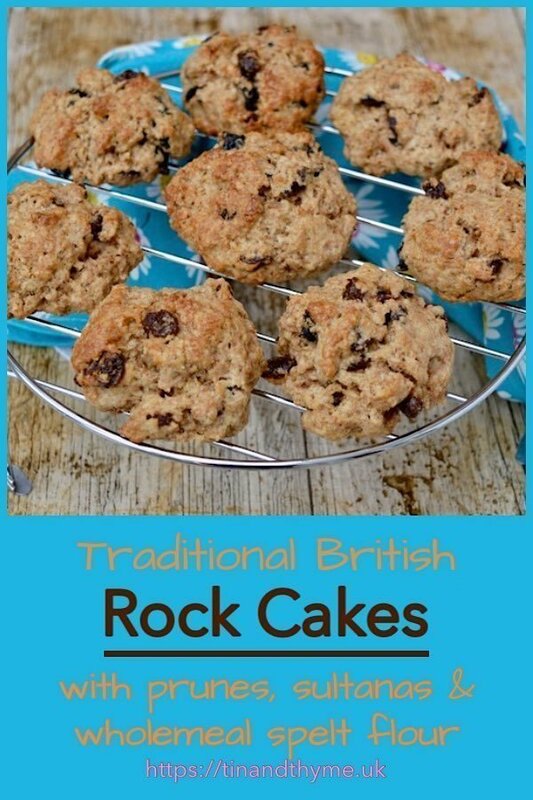 I have fond memories of rock buns growing up in Scotland but rock cakes? They look wonderful and I absolutely love your choices of dried fruits in them, Choclette. Thanks Jill, I don’t use prunes in my cooking enough. Do you think rock buns are any different to rock cakes, or is it all in the name? Ah just noticed Jill’s comment after I posted mine. Calling them rock buns must be a Scottish thing (I’m Scottish) as they’re definitely the same as rock cakes. Fairy cakes have always been known as”buns” to me as well. I think it may be a celtic thing. These sorts of cakes are called buns down in Cornwall too, though I’ve never actually come across rock buns. Rock cakes (or rock buns as I’ve always known them) were one of my favourite things to bake when I was little. I haven’t made them for years! I really like your suggestion of adding prunes or dates, might have to try that! My aunty adds a sprinkling of demerara or granulated sugar to the top before baking so they have an extra bit of crunch which is lovely. Hello Jo. Lovely to hear from you. I think rock cakes (or buns) get overlooked for much fancier fare, but they are really delicious and well worth making from time to time. Everyone who tries them always wants the recipe. I’ve got some prunes and been wondering what to do with them so this is perfect! Let me know what you think if you do try them Kat.